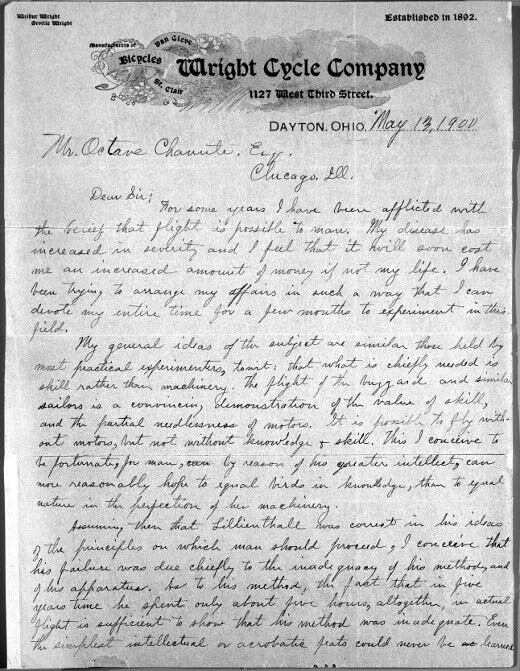 This extremely confident letter from one half of the Wright Brothers - Wilbur - was their first contact with renowned engineer Octave Chanute, an aviation pioneer and author of Progress in Flying Machines who went on to offer the brothers much invaluable advice over the coming years. 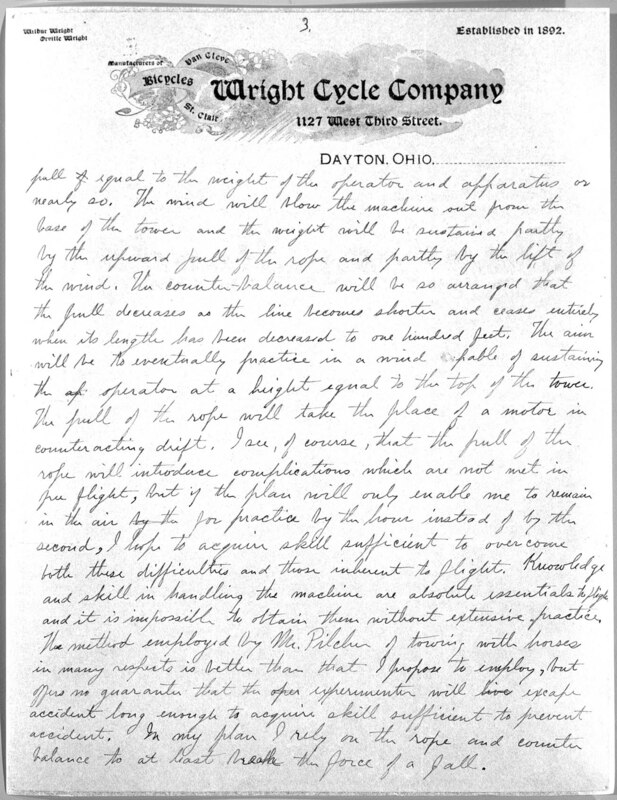 It was written three years prior to their first controlled flight and presents their plans to Chanute with a view to obtaining some guidance in return. 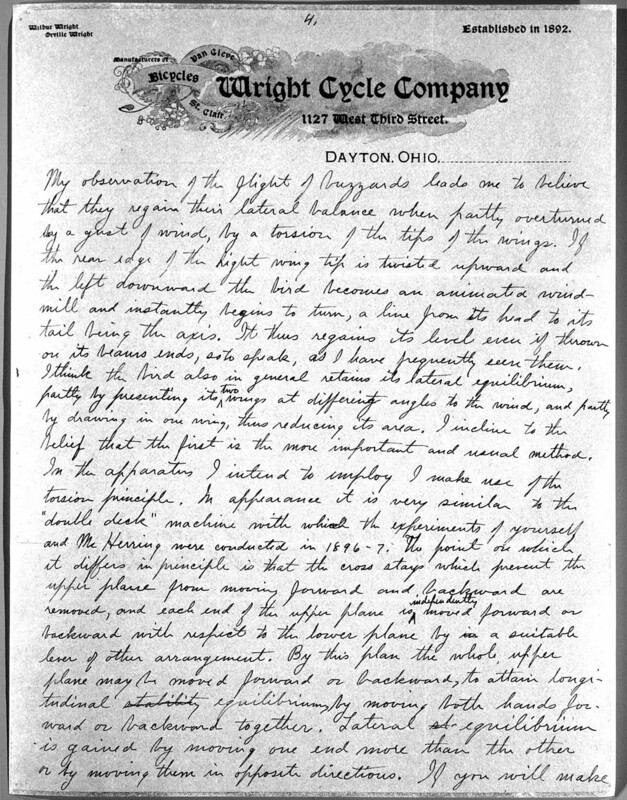 In the letter, Wilbur also mentions the failures of Otto Lilienthal, a fellow aviator who was among the first to fly successfully using a glider. He passed away in 1896 after falling and breaking his spine. My general ideas of the subject are similar to those held by most practical experimenters, to wit: that what is chiefly needed is skill rather than machinery. The flight of the buzzard and similar sailors is a convincing demonstration of the value of skill, and the partial needlessness of motors. It is possible to fly without motors, but not without knowledge & skill. This I conceive to be fortunate, for man, by reason of his greater intellect, can more reasonably hope to equal birds in knowledge, than to equal nature in the perfection of her machinery. Assuming then that Lilienthal was correct in his ideas of the principles on which man should proceed, I conceive that his failure was due chiefly to the inadequacy of his method, and of his apparatus. As to his method, the fact that in five years' time he spent only about five hours, altogether, in actual flight is sufficient to show that his method was inadequate. Even the simplest intellectual or acrobatic feats could never be learned with so short practice, and even Methuselah could never have become an expert stenographer with one hour per year for practice. I also conceive Lilienthal's apparatus to be inadequate not only from the fact that he failed, but my observations of the flight of birds convince me that birds use more positive and energetic methods of regaining equilibrium than that of shifting the center of gravity. 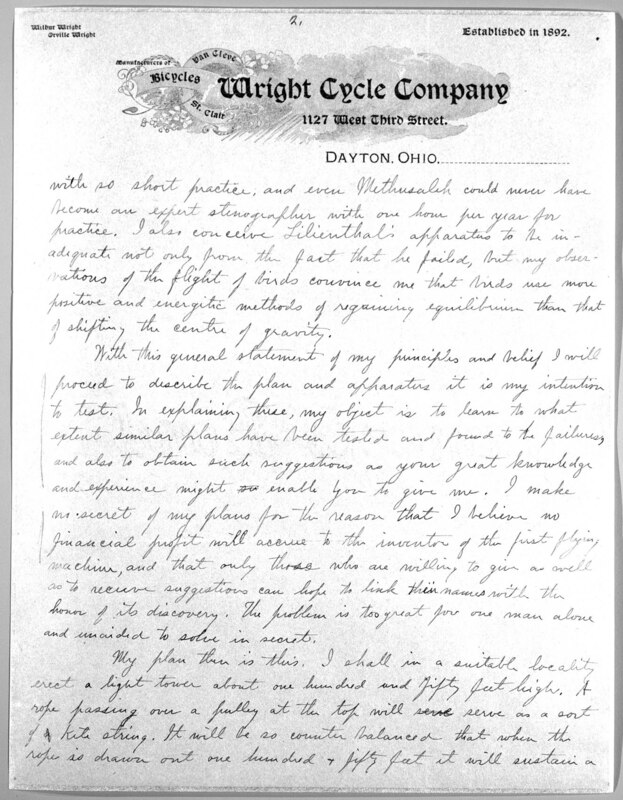 With this general statement of my principles and belief I will proceed to describe the plan and apparatus it is my intention to test. In explaining these, my object is to learn to what extent similar plans have been tested and found to be failures, and also to obtain such suggestions as your great knowledge and experience might enable you to give me. I make no secret of my plans for the reason that I believe no financial profit will accrue to the inventor of the first flying machine, and that only those who are willing to give as well as to receive suggestions can hope to link their names with the honor of its discovery. The problem is too great for one man alone and unaided to solve in secret. My plan then is this. I shall in a suitable locality erect a light tower about one hundred and fifty feet high. A rope passing over a pulley at the top will serve as a sort of kite string. It will be so counterbalanced that when the rope is drawn out one hundred & fifty feet it will sustain a pull equal to the weight of the operator and apparatus or nearly so. The wind will blow the machine out from the base of the tower and the weight will be sustained partly by the upward pull of the rope and partly by the lift of the wind. The counterbalance will be so arranged that the pull decreases as the line becomes shorter and ceases entirely when its length has been decreased to one hundred feet. The aim will be to eventually practice in a wind capable of sustaining the operator at a height equal to the top of the tower. The pull of the rope will take the place of a motor in counteracting drift. 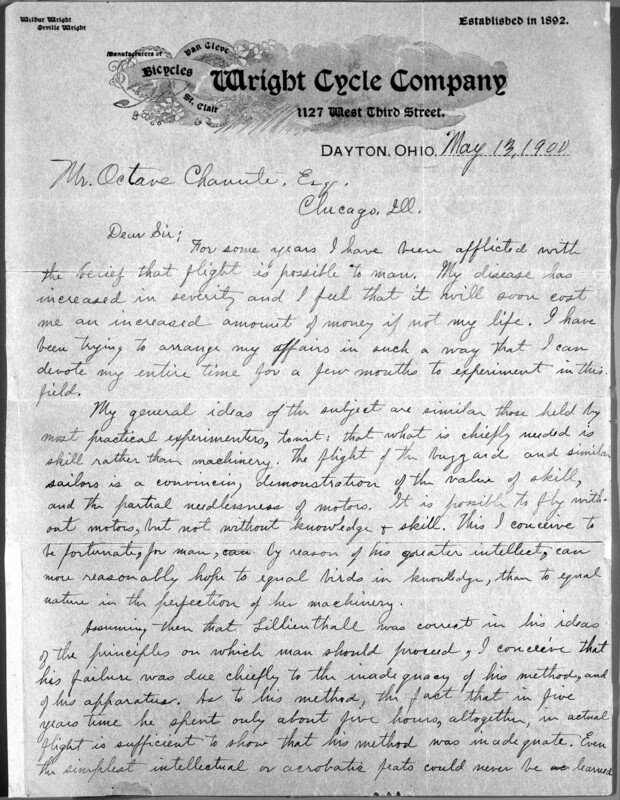 I see, of course, that the pull of the rope will introduce complications which are not met in free flight, but if the plan will only enable me to remain in the air for practice by the hour instead of by the second, I hope to acquire skill sufficient to overcome both these difficulties and those inherent to flight. Knowledge and skill in handling the machine are absolute essentials to flight and it is impossible to obtain them without extensive practice. The method employed by Mr. Pilcher of towing with horses in many respects is better than that I propose to employ, but offers no guarantee that the experimenter will escape accident long enough to acquire skill sufficient to prevent accident. In my plan I rely on the rope and counterbalance to at least break the force of a fall. My observation of the flight of buzzards leads me to believe that they regain their lateral balance, when partly overturned by a gust of wind, by a torsion of the tips of the wings. If the rear edge of the right wing tip is twisted upward and the left downward the bird becomes an animated windmill and instantly begins to turn, a line from its head to its tail being the axis. It thus regains its level even if thrown on its beam ends, so to speak, as I have frequently seen them. I think the bird also in general retains its lateral equilibrium, partly by presenting its two wings at different angles to the wind, and partly by drawing in one wing, thus reducing its area. I incline to the belief that the first is the more important and usual method. In the apparatus I intend to employ I make use of the torsion principle. In appearance it is very similar to the "double-deck" machine with which the experiments of yourself and Mr. Herring were conducted in 1896-7. The point on which it differs in principle is that the cross-stays which prevent the upper plane from moving forward and backward are removed, and each end of the upper plane is independently moved forward or backward with respect to the lower plane by a suitable lever or other arrangement. By this plan the whole upper plane may be moved forward or backward, to attain longitudinal equilibrium, by moving both hands forward or backward together. Lateral equilibrium is gained by moving one end more than the other or by moving them in opposite directions. If you will make a square cardboard tube two inches in diameter and eight or ten long and choose two sides for your planes you will at once see the torsional effect of moving one end of the upper plane forward and the other backward, and how this effect is attained without sacrificing lateral stiffness. My plan is to attach the tail rigidly to the rear upright stays which connect the planes, the effect of which will be that when the upper plane is thrown forward the end of the tail is elevated, so that the tail assists gravity in restoring longitudinal balance. My experiments hitherto with this apparatus have been confined to machines spreading about fifteen square feet of surface, and have been sufficiently encouraging to induce me to lay plans for a trial with a full-sized machine. 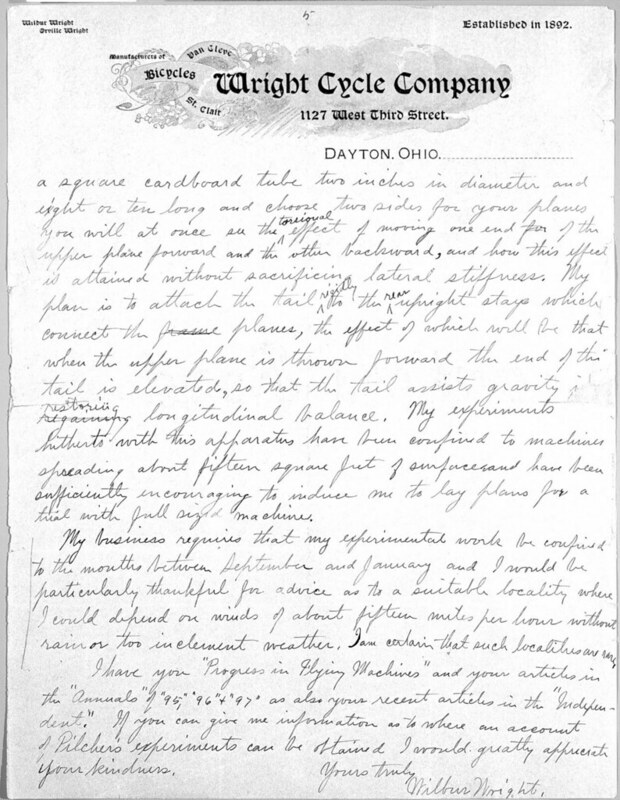 My business requires that my experimental work be confined to the months between September and January and I would be particularly thankful for advice as to a suitable locality where I could depend on winds of about fifteen miles per hour without rain or too inclement weather. I am certain that such localities are rare. I have your Progress in Flying Machines and your articles in the Annuals of'95,'96, & '97, as also your recent articles in the Independent. If you can give me information as to where an account of Pilcher's experiments can be obtained I would greatly appreciate your kindness.